Claude Arpi: China scared of 17 Mountain Strike Corps? Yesterday Xinhua announced that Xi Jinping, the Chairman of the Central Military Commission, presented honorary titles to two military units for their outstanding services. One is Unit 77656, which is termed a ‘model plateau battalion’, was awarded for its outstanding performance “in safeguarding borders, ensuring stability and helping disaster relief”. The other award winner is the PLA Navy Submarine Unit 372 which was honored as a ‘model submarine for performing marine missions with excellence’. Xi also awarded ‘merit citations’ to four military units and 15 persons for outstanding services. Troop 66114 was given a first-class merit citation for its outstanding contribution to completing tasks, and units 91515, 94669 and 96261 were given second-class merit citations for their outstanding performance in strengthening fighting capacity. Well, Gangba County (Khamba Dzong in Tibetan) is located north of Sikkim, west of the strategic Chumbi Valley, where for decades an Indian Trade Agent was posted (in Yatung). The move to honour Unit 77656 is probably due to Beijing’s nervousness; remember that Delhi has decided to raise a Mountain Strike Corps in the area (17 Corps). While India is aware of the difficulty of defending the Siliguri Corridor, China knows that the Chumbi Valley is one of their weakest points on the plateau. This probably explains the award to Unit 77656. India should take note that the PLA's crack unit is posted at the gate of Chumbi Valley ...and India. Incidentally, Khamba Dzong entered in the history in 1903, when Col Francis Youngbushand attempted to negotiate a treaty with the Tibetans. Only after talks failed, the 1904 Tibet operation was mounted. I am posting here extracts of my book, The Fate of Tibet. Curzon was a man in a hurry and he had decided to act. In June 1903, Colonel Younghusband was dispatched with some troops to Khamba Dzong, inside Tibetan territory. This small British army consisted of five officers and 500 troops. 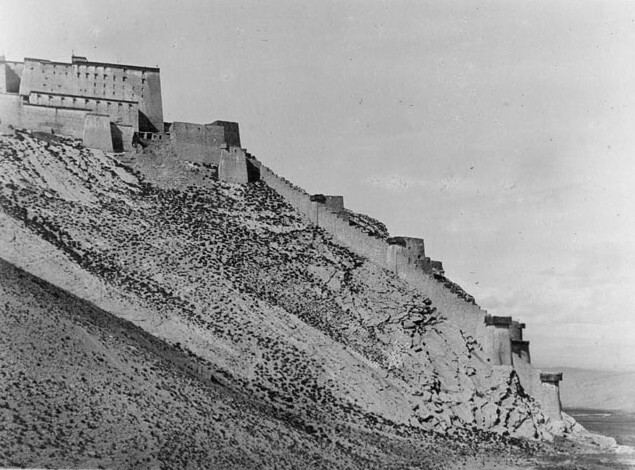 On hearing news of the approaching British army, the Tibetan Government immediately sent two negotiators with the brief to stop the advancing army and to hold talks at a border post called Giagong. A Tibetan-speaking British officer, Captain O’Connor advanced to Giagong to be told by the Tibetan representatives that talks should be held on the spot. This was refused by the British who continued to advance toward Khamba Dzong arguing that they had permission from the Manchus in Beijing to hold negotiations. The Tibetan Representatives tried in vain to block their path. In the meantime the Tsongdu, alerted by the ominous news from the border, sent an urgent message to their representatives on the border, instructing them not to allow a single British soldier or civilian into Tibetan territory. It sounds just like the Indian Parliament instructing the Indian Army, some 58 years later, not to let an inch of Indian territory be occupied by the Chinese in the high Himalayas. History sometimes repeats itself and the debacles in Khamba Dzong or in NEFA prove that one has to be militarily prepared for it when one decides that “not an inch of our territory should be occupied.” In 1904, Tibet was no match for a marching modern army. But the Tibetan National Assembly was living in the ‘white clouds’ of the Roof of the World. Wishful thinking, rhetoric and Mantras were not enough to balance the woefully poor preparedness of the Tibetan troops. More was needed to block the decisiveness of the Viceroy and his young Colonel who had decided to force the Tibetans to sit at the negotiating table. The stubbornness and intransigence of the Tibetan Assembly in refusing any contact with the ‘foreigners with yellow eyes’ did not help the matters to unfold smoothly. When more knowledgeable elements, such as Kalon Shatra, tried to make the Kashag aware of the power of the British in the world and the consequences that refusing to deal with them, even to open their letters might have, he was accused of being a spy for the Crown and of having received some bribes from his ‘masters’ when he was the Resident Representative in Darjeeling. To be fair to the Tibetans, one should recall their blissful ignorance of the world outside. At this crucial time, the Tsongdu took over the decision-making power from the Kashag, which was considered to be pro-British; the Great Monasteries were convinced that the British were the enemy of Buddhism and only interested in extending their empire. This may not have been totally untrue. Once in Khamba Dzong, representatives of the three great monasteries as well as senior Tibetan officers came to meet the British officers. However they immediately got stuck as both parties could not agree on a place where the negotiations could take place. The Chinese Representative in Shigatse also appeared on the stage but he turned back when he was told by the Tibetans and the British that his presence was not necessary. The British troops were also visited by the Panchen Lama’s representative and the Abbots of the Tashi Lhunpo who unsuccessfully tried to mediate. Many visitors dropped by, mainly out of mere curiosity. Younghusband had arrived at Khamba Dzong, but the negotiations remained at a standstill with the Tibetans still refusing to discuss commercial or any other agreements. Younghusband began to feel that he was being taken for a ride. When he asked for the Ambans to be witness to the discussions, the Tibetans retorted that the Ambans had nothing to do with commercial matters. Finally after three months the British troops received orders to return to India. The advent of the winter was the main reason for this temporary retreat. In Lhasa, the power struggle between the conservative forces in the Tsongdu and some of the more liberal (at least better informed) ministers intensified. As a result, four Kalons ended up in jail, accused of supporting the British. One even committed suicide. The Tsongdu was more determined than ever to stop any advance by ‘British devils’ into Tibet. The first days of 1904 saw a British expedition led by Col. Francis Younghusband and Claude White with five thousand Sikh and Gurkha soldiers begin their march to Gyantse. They had brought with them rifles, machine guns and artillery. When the troops reached Tuna, between Phari and Guru, some negotiations started again without much success. The Bhutanese Raja, known as the Tongsa Penlop also tried to mediate at Phari and suggested that talks should start in Gyantse, but he was unable to convince the Lhasa authorities. The Choegyal of Sikkim, a relative of the Tibetan General who was the military commander in Yarlung valley, advised the latter to negotiate with the British. Dapon Lhading was already aware of the strong reinforcements stationed in Sikkim as support for the troops of Younghusband: “For the Tibetan army to challenge the British was like throwing an egg against the rock - the egg could only be smashed,” wrote the Choegyal. But the Tibetans were not ready to listen. In the meantime, the Tibetan troops entrenched themselves behind a five-foot wall at Chumik Shinko between Tuna and Guru. In Asia, one does not start a war before having tea; Younghusband paid a visit to the Tibetan camp at Guru and later received Dapon Lhading at his camp in Tuna; but despite the courtesy calls and offering of scarves, tea and refreshment, the stalemate continued. The tea parties could have gone on too, but Younghusband was a young man in a hurry; during the course of his final visit to the Tibetan camp, he informed the Tibetan General that he would be advancing towards Gyantse the next day.